The federal bill was drafted in response to Vermont's GMO labeling law. Supporters say it creates a national standard, but critics say the law is weaker than Vermont's. Congress has passed a national GMO labeling bill that would nullify Vermont's labeling law, which went into effect July 1. The federal bill passed the House Thursday with solid support from both Democrats and Republicans, sending the legislation on to President Obama's desk. It would require most processed foods with genetically engineered ingredients to carry either a text label, a symbol or an electronic code to be read by smart phones. Gov. Peter Shumlin says Vermont was overpowered by the food industry's lobbying power and financial resources in the fight over labeling of genetically modified food. Vermont lawmakers, along with those from Maine and Connecticut, unanimously voted against the bill. Critics have argued that this national mandatory labeling requirement is weaker than Vermont's law, in part because it would allow a "QR" code that is scanned by a smartphone to count as a label. "It's a mode of labeling that is only available to a certain percentage of Americans… it would exclude somewhere up to 100 million Americans from actually being able to access that labeling, and those are low-income, rural and the elderly. So that's absolutely discrimination on its face," says Andrew Kimbrell, the executive director for the Center for Food Safety. That's in part because the bill says the “bioengineered” label only applies to foods that contain genetic materials. “That would mean that foods from GE sources that you can’t detect [the genetic materials]— that’s all your oils, sugars, fructose corn syrup, all that stuff — they would be exempted from the bill,” says Kimbrell. The bill leaves many labeling details to be determined by the U.S. Department of Agriculture, including what percentage of genetically engineered ingredients a food needs to have to require a label. GMO, GE, Bioengineered...What Do All These Food Labels Mean? 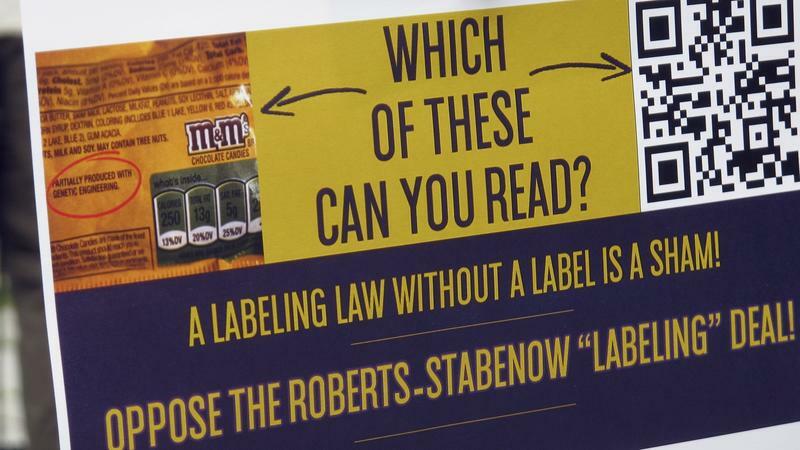 Vermont’s GMO labeling law aims to provide consumers with more information, and yet it's just one of a growing number of food labels popping up on grocery shelves. After months of bargaining and backroom arguments, the Senate has voted in favor of a new national standard for labeling food that contains ingredients from genetically modified crops. The essence of the deal: Companies will have to disclose their GMO ingredients, but they won't have to put that information right on the label. Many food companies are fiercely opposed to such GMO labels because they believe consumers will perceive them — incorrectly — as a warning that those products are nutritionally inferior or even unsafe to eat. Now There's A Label, But What's A GMO? While the terms “GMO” and “genetic engineering” carry some stigma for certain audiences, to scientists simply agreeing on a definition of what counts as genetically engineered — and what doesn’t — isn’t so straightforward.